Using your legs in weight-bearing exercise is critical for brain health, new research shows. Researchers found that moving the large muscles in the legs, through activities such as walking, climbing stairs, and running, triggers the production of stem cells in the brain—helping that critical organ to renew itself. “We are meant to be active: to walk, run, crouch to sit, and use our leg muscles to lift things,” study author Raffaella Adami tells MedicalNewsToday.com. For the study, researchers immobilized the hind legs of a group of mice for 28 days, then examined a specific area of their brains known as the subventricular zone. They found the neural stem cell activity of the mice had plummeted by 70 percent. Declines in oxygen levels associated with reduced physical activity also altered the rodents’ metabolism. These findings may explain why the health of people who are bedridden often deteriorates rapidly. 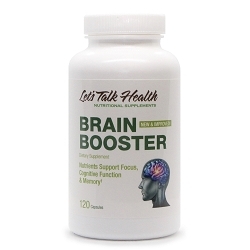 In addition to the physical aspect of brain health, our New & Improved Brain Booster feeds the brain nutrients critical to the brain’s ability to focus and improve short term memory. Our brains need good nutrients, just like the rest of our body. In fact, it could be argued that good nutrition for the brain is vital to our quality of life as we age.